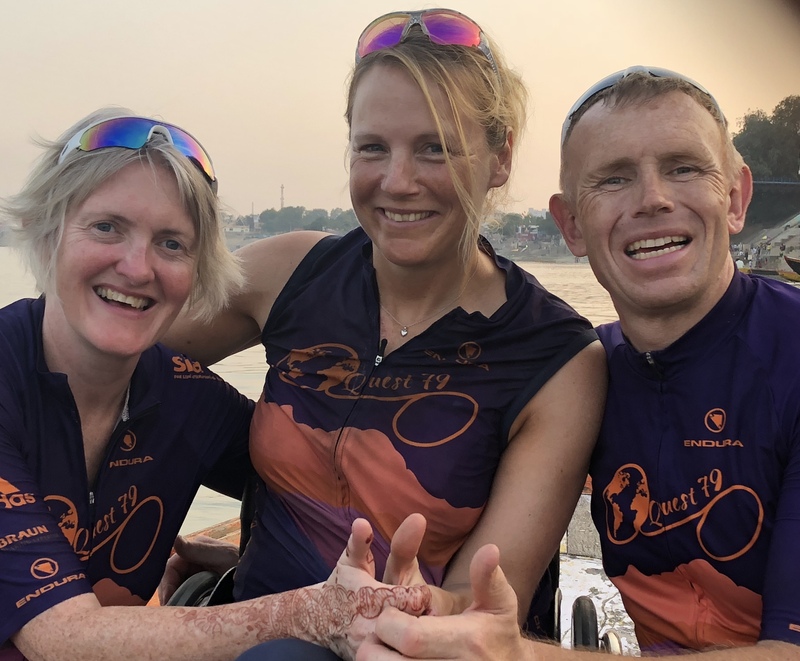 Para-cyclist Karen Darke has successfully completed her latest Quest79 challenge which involved cycling along the Sacred Way in India, from Gangotri – a village by the source of the Ganges, to Varansi – an ancient city and the river’s Sacred Heart. This challenge was part of a set of endurance cycling events that Karen set herself to complete across seven continents between the Rio Paralympic Games in 2016 and the upcoming Tokyo Paralympic Games in 2020. Since winning gold in Rio, the number 79 has played a significant part in Karen’s life as it was her 79th medal for her country and 79 is also the atomic number of gold, and so Karen’s Quest79 dream was born. Karen undertook her latest quest with two friends Christine Graham and Kevin Benstead neither of whom had ever attempted such a trek and the three friends travelled a total of 1500km over three weeks. “Each of my quests are connected to water and I have always loved the mountains and The River Ganges in the Himalayas. For many years I have been fascinated by that part of the world and it had been my dream to one day explore the river, surrounding land and meet the people who live there,” explained Karen. tions. The team at Gerald Simonds have been fantastic and the seat is so comfortable and despite the extreme heat we were cycling in I had no issues with pressure sores”. Gerald Simonds worked in conjunction with the manufacturer, Supracor to create the perfect seat shape using Stimulite sheets to ensure Karen had four custom seats produced in various levels of thickness and density so that she had suitable seats for training, racing and her Quest79 challenges. “Karen is a true inspiration to everyone here at Gerald Simonds with her Paralympic success and ongoing quests. Seeing one of our solutions make such a difference to Karen in terms of comfort and success is incredibly rewarding and we wish her well as she continues her preparations for 2020,” commented Doug Robinson, Managing Director, Gerald Simonds Healthcare. If you would like more information on Karen’s latest Quest79 challenge, or to contact her to find out how you could create your own challenge, visit her website. For more information on the full range of solutions available from Gerald Simonds or to book a no-obligation demonstration call 01296 380200 , email or visit the website. Fancy playing tennis at the 2020 Tokyo Paralympic Games?